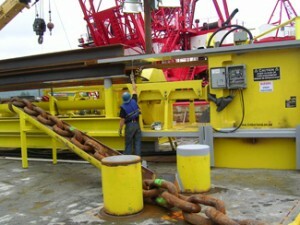 Manson Construction of Seattle, WA required a field test of horizontally opposed chain jacks rated at 1100 tons pull which would be used to deploy, set and load test permanent seabed mooring anchors. Timberland Equipment developed the control and monitoring system for simultaneous operation, measurement of the length of recovered chain, and certified dual load measurement and drift instrumentation. Timberland personnel were onsite during the entire operation to monitor and assist the installation team and to supervise operation of the jacks. The testing system called for the design of two large horizontal side-by-side modules to be installed on the deck of a small barge to guide and support the chain for correct alignment on jack entry and exit. The apparatus would make provision to pass large connectors through the jack and horizontal guide under load. To complete the tests, the system would generate a sustainable line speed to drag and set the anchors on the sea bed, then generate and hold the test load on both anchor lines over prolonged period. The monitoring system would measure the specific anchor chain drift and test load throughout test. The measurement of the test load and anchor chain drift was critical to the test. If this was not accomplished satisfactorily, the anchors would have to be recovered and redeployed. All eight anchors were set, tested and certified on the first attempt allowing Manson to complete their contract under the scheduled lead time.